I love baking bread. So I was excited when I was asked to bring rolls to Thanksgiving dinner. I knew that I would make plain white pillowy dinner rolls using that tried-and-true Basic Rolls recipe from Craig Clayborne’s The New York Times Cookbook, but thought it would be nice to have a whole wheat option, too. After pulling several recipes from various cookbooks and the net, I came up with this version. These rolls were even better the next day as a vehicle for leftover turkey! Put water and butter in a microwave safe bowl and heat on high for 45 seconds. The water should be just warm to the touch. In a medium bowl, stir together all ingredients except all-purpose flour. Add a cup of all-purpose flour and stir. Add enough remaining flour to make a soft dough. Turn out onto a well floured pastry board or clean counter top. Knead dough until smooth and elastic–6-8 minutes. Place in a lightly greased bowl and cover. Let dough rise in a warm spot until doubled in size–about an hour should do. Punch down dough and turn out onto a lightly floured board. Divide dough in half, then divide each half into 8 equal pieces. If you have a kitchen scale, each piece should be about 2 ounces. Roll each piece on the board using a circular motion with your hand in a claw position. Use your palm and fingers to form a tight skin on each roll. If the rolls are slipping on the surface, use a dab of water to help them stick a little to form that tight skin. Place rolls evenly apart in a lightly greased 8″ x 13″ brownie pan or quarter sheet pan. 15 rolls fit perfectly, so you decide what to do with that extra roll. Cover and let rise for about 30 minutes. Meanwhile, pre-heat oven to 350. Bake for 25-30 minutes until golden brown on the top. For even baking, turn the pan half way through cooking. Remove from oven and let rest for 5 minutes, then remove from pan to a wire rack to prevent the rolls from getting soggy on the bottom. If not serving immediately, put the rolls back in the pan, cover with foil and re-heat in a 350 oven for 5 minutes. There were no Brussels sprouts at the Aptos Farmers’ Market today, so I had to make do with another favorite veggie: Romanesco broccoli. It’s kind of a cross between broccoli and cauliflower with beautiful, light green spires. Romanesco is milder and less bitter than broccoli and has an almost creamy texture. I thought that texture would blend well with white beans (another one of my favorites). I perked up the flavor a bit with crispy garlic slices and sun-dried tomatoes. This recipe would also work well with those Brussels sprouts I was craving or regular broccoli. Soak sun-dried tomatoes in hot water for 20-30 minutes. Drain and julienne. Bring a pot of salted water to a boil. 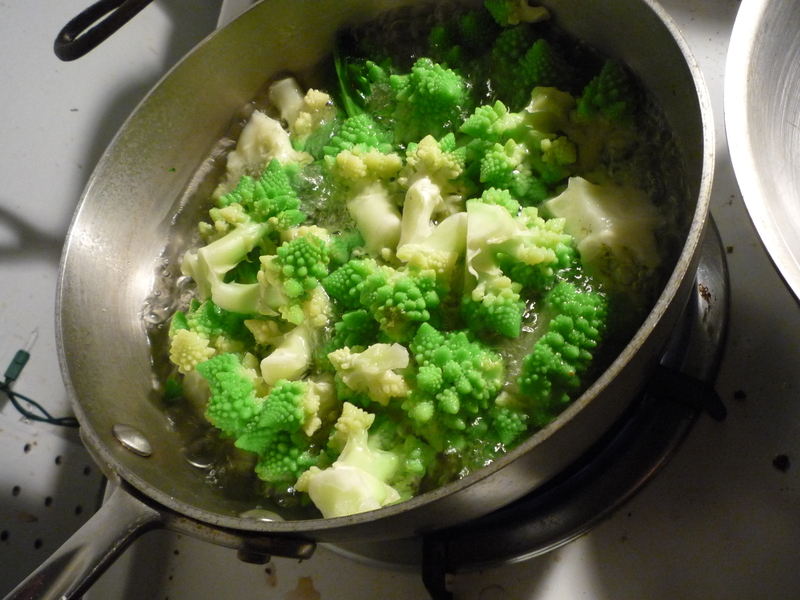 Add Romanesco and return to a boil. Cook for 2 minutes, then drain and run under cold water. Heat oil in a saute pan over medium heat until oil shimmers. Add garlic slices and saute until lightly browned. Remove garlic with a slotted spoon and set aside. Add tomatoes to the pan and stir and saute for a minute. Add Romanesco and cook and stir for another 2 minutes. Add beans and season with salt and pepper. Stir and cook for another 2 minutes. Add garlic slices and serve immediately.